Cloud 9 , Aaron Weissblum, F. X. Schmid, 1999. Cloud 9 is a fun, card-counting and bluffing game. Because it is simple to play and it supports 2 to 6 players, this is a game that we will drag out as a warm-up game in many game sessions. At the beginning of the game, all players join a balloon trip to the clouds and place their wooden figure in the balloon. Each player is dealt 6 cards from a special deck of 80 cards. An active player is selected and rolls special dice to figure the cost of making the balloon rise one level. 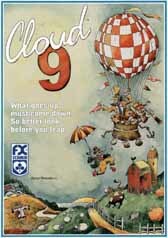 After rolling the dice, each player decides whether to jump from the balloon and accept the score of the current cloud level, or ride with the other players and try to gather a higher score on the next level. The active player must pay the cost of the balloon trip with his or her cards or else the balloon crashes and all players still on the balloon score no points. Then the next player becomes the active player and repeats the process. The balloon trip ends when all players have jumped out of the balloon, the balloon crashes, or the balloon sails to the highest level. After a balloon trip, everyone receives one card to replenish the cards spent, and a new balloon trip begins. The game is won by the player with 45 or more victory points, although many players think 45 is too little and the game ends too quickly. The board is rather simple with a score track around the edge, and the 9 cloud levels in the center. Each cloud level shows the number of points scored at that level, and the number of dice to roll to figure the cost to rise another level as shown in the table. Notice that the cloud levels show a dramatic rise in scoring and a somewhat linear rise in dice cost. The 4 wooden dice are identical with 2 blank sides and one side for each color: blue, red, green, and yellow. The deck of 80 cards consists of 4 wild cards, 4 "Pass the Barn" cards, and 18 each of color cards. One problem is that the dark, rich blue and green colors are very similar looking and tough to distinguish from across the table. The wild card may substitute for any color card to pay for the trip. The "Pass the Barn" card is used to force another player to pay the cost of raising the balloon. Luckily, each player once again gets to vote whether to stay or jump from the balloon before the new player attempts to raise the balloon. There are also two wooden people markers for each player: one for the score track and one for showing whether a player is in or out of the balloon. Frequently, a problem occurs when players jump from the balloon: they invariably grab the nearest piece which often is the score track marker. I've replaced the people markers for the score track with simple colored wooden cubes. At least with different size markers, people know the cube is the score and the human is the balloon passenger. Let me digress a moment to discuss one common game mechanism: score tracks. Score tracks are a nice game mechanism because it is easy to tell who is leading and who is losing at a glance. Tracks also get rid of the exchanging and shuffling associated with play money or scoring chits. They also get rid of non-obvious cheating when someone palms an extra bill or makes incorrect change from the score pile. However, score tracks are subject to jostling and other misplacements such as in Clound 9 when a zealous player throws 4 dice at the board at once. Good luck remembering where the markers belong! Keeping score with paper and pencil alleviates this problem, but then you always have to scrounge up these items. What would really be ideal for many games would be some sort of score track similar to a cribbage game with pegs and holes to prevent jostling. Anyway, back to Cloud 9 . The fun in this game comes from counting cards and deciding whether to stay or jump from the balloon. With a good card memory, you gradually develop some idea of the active player's holdings. It is important to note if any of the players are deficient in a card color, as this will determine the odds of your success at reaching the next cloud level. It is also important to remember the number of wild cards played and the approximate number of each color card played. As you can see, a good card memory helps you make better play. In addition to remembering cards, it is also useful to watch the moves of the people ahead of you. If two players are beating you, and both of them are staying in the balloon, then it is important that you stay in the balloon also. This looks your fate with theirs and prevents them from pulling away from you. If you are in the lead, you may want to jump out of the balloon early to nudge your lead forward. But these words are not hard and fast rules, just thoughts to consider when you play the game. After several games, we feel that points scored is proportional to the difficulty. One final strategy note involves the "Pass the Barn" card. Like many games with a clockwise rotation of play, your position in the turn order influences who you should pass the barn to. If you have few cards, it does not make sense to "Pass the Barn" to your right. If that person pays, the active player rotates to you, and you must now attempt to pay for the next cloud level. However, if you "Pass the Barn" to the left, you get several turns of clouds before you are expected to pay for the balloon trip. Comparing this to another balloon game, Montgolfiere , I would say Cloud 9 requires more strategy and more play expertise to be good. With Montgolfiere one has to guess at the possible moves of all the other players. Unless you are a mind reader or an infallible predictor of human psychology, this is nearly impossible. With Cloud 9 you can score and move ahead with little care of the other player's choices, just a good memory of the other player's holdings. Thereby in Cloud 9 it is easier to form a strategy based on odds. All in all, this game is not rocket science and does not offer a world of deep strategy and unfolding game development. However, it is a fun warm-up game, and it supports 6 players with little downtime in between moves. The game is very quick, perhaps 30 to 40 minutes at the most. Each time I have played, people have immediately requested a second game. I've had a lot of fun with this game, and I would recommend it for a lighter party game. [an error occurred while processing this directive] Last modified: Thursday, 09-Jun-2011 12:36:43 MST.